Britten motorcycle books cover the story of John Britten and his very distinctive machines. Britten Motorcycle Company is a Christchurch, New Zealand motorcycle manufacturer created by John Britten in 1992. John Britten by Tim Hanna (2003). Since his tragically early death from cancer in 1995, John Britten has taken his place as a New Zealand hero. He and his dedicated team in Christchurch, designed and built from scratch the Britten V-twin motorcycle. For a time this machine was probably the fastest four-stroke bike in the world. It could wheel stand at 150 miles per hour simply by opening up the throttle. After five years of research, the author has finally been able to give due credit to the man and his achievements. The biography details his early life, the development of his vision and the early prototype motorcycles, and then the gruelling cycle of hard work, set-backs and failures before the Britten V-twin finally was able to beat the world's best. His bike had legions of fans worldwide, captured by the elegance, originality and power of his machine, but also by the romance of his story - an individual taking on some of the worlds' biggest and best motorcycle manufacturers and winning. This title should appeal to readers both inside and outside the motorcycle fraternity because of its universally inspiring theme - that extraordinary things are possible when a person turns their dreams into reality. 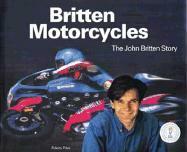 Britten Motorcycles: The John Britten Story by Felicity Price (2004). John Britten was a Kiwi legend of the late 20th century whose distinctive, hand-built, pink-and-blue racing motorcycle broke four world speed records and reached iconic status worldwide.